Oceans 3 -Rat Pack Tribute to Frank Sinatra, Sammy Davis Jr and Dean Martin plus much more. Ocean’s 3 combine great live music with their own unique off the cuff humour, guaranteeing a great night for all.This Rat Pack Tribute specialise in providing great vocals and entertainment for weddings and corporate events. Based in the Aberdeenshire area they travel throughout Scotland. Ocean’s 3 pride themselves on professionalism and quality; a trademark that has gained them a strong reputation in the north-east of Scotland and beyond. Over the last few years, Ocean’s 3 have entertained many people and even helped to raise hundreds of thousands of pounds for different charities such as the Anthony Nolan Trust and CLAN. The boys have also played at many prestigious events and venues such as His Majesty’s Theatre as part of the Lord Provost’s Variety Show, Union Terrace Gardens as part of Offshore Europe Week and the Aberdeen Exhibition and Conference Centre as part of the All Energy Ball. Travelling further afield, in 2009 Ocean’s 3 performed on a National Trust for Scotland cruise to Iceland. Ocean’s 3 can tailor make their show to suit the needs of the client, so whether you require background music for your wedding reception or a full- blown cabaret show complete with audience participation to entertain clients and colleagues at your business’ next big event, they can deliver. This great music should be enough, but it is more than just that that sets Ocean’s 3 aside from other groups. It’s the sense of fun and enjoyment they exude when they perform that they can transfer to an audience that makes them that little bit different. 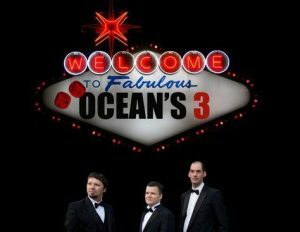 One thing is for certain, whatever your event, booking Ocean’s 3 guarantees a great night for all.